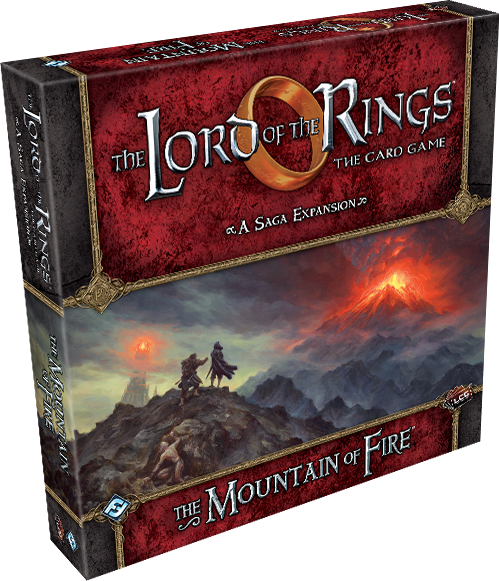 Fantasy Flight Games is proud to announce the upcoming release of The Mountain of Fire, the sixth and final The Lord of the Rings Saga Expansion for The Lord of the Rings: The Card Game! Dire, world-shattering stakes. Epic Multiplayer Mode. The climactic conclusion to your The Lord of the Rings campaign. In The Mountain of Fire, you'll find three epic saga scenarios inspired directly by The Return of the King. Two of these scenarios thrust you deep into the heart of Mordor, where you'll join Frodo Baggins for adventures in Cirith Ungol and along the road to Mount Doom. 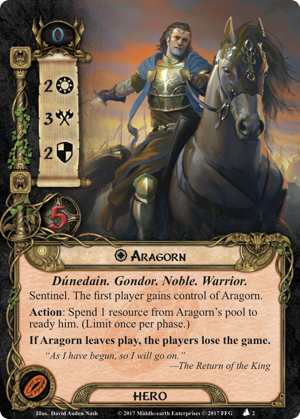 The third will give you the chance to ride beside Aragorn as he, Gandalf, Prince Imrahil, and Éomer lead a valiant army of seven-thousand into the teeth of a battle they cannot possibly hope to win. All they can hope is that they will buy enough time for Frodo to carry the One Ring back to the fires in which it was forged. "His thought turned to the Ring, but there was no comfort there, only dread and danger. No sooner had he come in sight of Mount Doom, burning far away, than he was aware of a change in his burden." In The Mountain of Fire, the stakes are higher than ever before. Your efforts will contribute directly toward the end of the Third Age of Middle-earth; you'll either save it or see it plunged into an eternal darkness under the rule of Sauron, the Dark Lord. 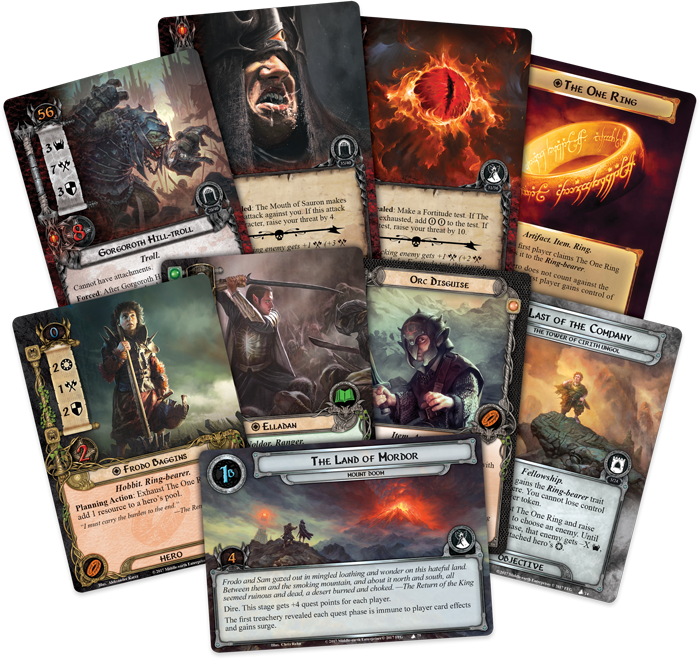 Accordingly, The Mountain of Fire introduces a new keyword, "dire," that appears on several of its quest cards and that represents the world-changing endeavors that your heroes must undertake. Whenever the main quest has the dire keyword, your threat elimination level is increased to "99," but you cannot reduce your threat by more than one each round by non-boon player card effects. At the same time, the threat value for triggering Valour effects is changed from forty threat to eighty. This means you'll find plenty of room for your battles to grow larger than ever. You'll spot enemies on the horizon that may not engage you for many turns. You'll find it harder to sneak quietly and secretly through the land of smoke and ash. And you'll feel the tension like never before as your threat level rises from forty to fifty and then beyond, forcing you to fight the inexorable tide of enemies or muster the strength to place one foot forward in front of the other along the climb to the fires of Mount Doom. Not only does The Mountain of Fire force you to face greater threats than ever before, it allows you to confront them in any of four different modes. You can play the expansion's scenarios as standalone adventures in the game's standard play mode. You can play through them as the climactic culmination of all the choices and struggles you've faced in Campaign Mode since you first left the Shire in The Black Riders. Or you can play its last two adventures simultaneously in a dramatic Epic Multiplayer Mode, either in standard mode or as part of your campaign. In this Epic Multiplayer Mode, you and your friends split into two groups and tackle the final two scenarios at the same time. 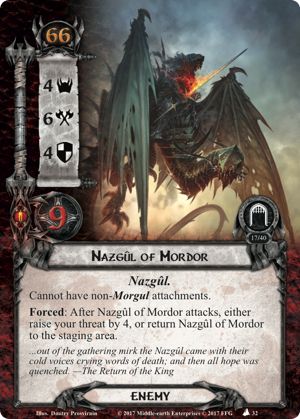 While one group helps Frodo along the final stages of his journey to Mount Doom, the other marches to the Black Gate in order to draw away as many of the Orcs, Trolls, and Nazgûl as possible. Ultimately, Frodo's group must destroy the One Ring in order to save Middle-earth, but should the other group fall at the Gates, Sauron will be able to turn his full attention to the soft little feet padding up Mount Doom… and all will be lost. "Now all is over. I am glad you are here with me. Here at the end of all things, Sam." In the midst of such momentous events—and thrust into battle against the world's greatest evils—you'll find yourself more appreciative than ever of Frodo Baggins (The Mountain of Fire, 1) and Aragorn (The Mountain of Fire, 2) and their fateful heroics. Both of these heroes gain new form in The Mountain of Fire, as they grow more fully into their roles. Frodo is now no longer the innocent Hobbit who wondered whether or not he should use the One Ring to hide from Black Riders; his spirit is now woven more fully into his role as Ring-bearer, carrying both its terrible burden and much of its benefit. 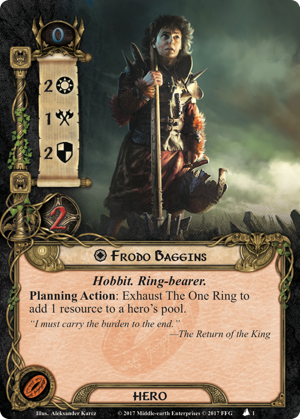 While he's not completely its Master, the Ring responds to him, and he can use it to give resources to the heroes accompanying him. Aragorn remains fundamentally the same. After all, he had already traveled far and wide and endured many trials before he first met the Hobbits in Bree. But The Mountain of Fire finds him changed, nonetheless. He's no longer supporting the Ring-bearer as part of the Fellowship, nor is he trying to piece the Fellowship back together. His earlier quests are all complete, and only one remains. Aragorn heads to the Black Gate to meet the enemy in battle and buy the Ring as much time along the road to Mount Doom as possible. And, as a result, The Mountain of Fire finds Aragorn ready to stand and fight until the bitter end. Of course, while these may be the two most important characters to play a part in your Saga, they're not the only ones you'll find in The Mountain of Fire. 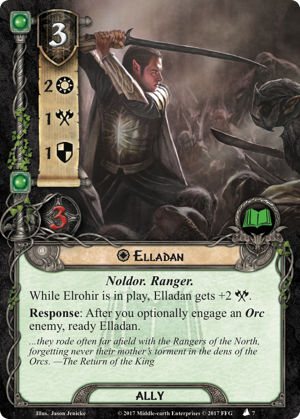 You'll also find two more heroes and unique allies for all four spheres, including the sons of Elrond, Elladan (The Mountain of Fire, 7) and Elrohir (The Mountain of Fire, 8). Driven by a thirst for revenge against the Orcs that imprisoned and tortured their mother, these Noldor Rangers rode from Rivendell to Gondor to join Aragorn in the war against Mordor. And you'll find their blades tremendously useful in the battles to come. 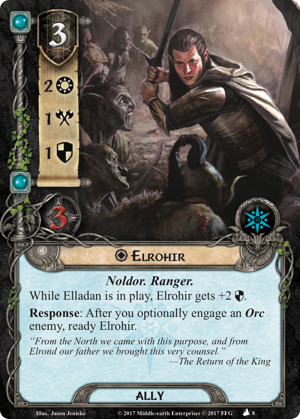 When he's with his brother, Elrohir defends at a Defense Strength of three; just as Elladan fights at an Attack Strength of three beside his twin. And whenever you optionally engage an Orc enemy, both of these Elves ready, no matter how tired they become, nor how grim the tide of war. These are but two of the nine different player cards (three copies of each) that you'll find in The Mountain of Fire, and while these Elves may help you carve you way through your enemies, you'll find other cards to help you raise your spirits and evade the evils around you. "The mantling clouds swirled, and for a moment drew aside; and then he saw, rising black, blacker and darker than the vast shades amid which it stood, the cruel pinnacles and iron crown of the topmost tower of Barad-dûr." All your trials have led you here. The battles you've fought. The mountains you've climbed. The pain you've suffered. The choices you've made. At the end of your road, the fate of the world is at stake, and the Eye of Sauron is upon you. Gather your strength, and see your journey to its end. The Mountain of Fire (MEC62) is scheduled to arrive at retailers in the third quarter of 2017!